Humble, extremely dedicated to his craft and brimming with enthusiasm, Joe Willock’s impact when afforded first-team opportunities by Unai Emery has been massively encouraging. Looking comfortable at the highest level and growing in confidence with every passing chance, he’s notably scored three goals in his three matches on his way to becoming the first Arsenal teenager to score in the FA Cup since Aaron Ramsey in 2010. Working tirelessly to continually improve and stake his claim for more senior minutes, he’s done everything in his power to fulfill his dream of making it at Arsenal. “It’s something that I’ve always dreamed of doing, to have my name on the back of a shirt and to be playing for Arsenal Football Club at the Emirates,” he told Arsenal’s official website. Although his body of work at the highest level has only comprised of 270 minutes of action, he’s looked right at home stepping up in class. Unfazed and letting his skill set do the talking, the 19-year-old’s seizing his chances to impress Emery. A midfielder with just about all the necessary characteristics to shine in the modern game, he blends physicality, athleticism and technique wonderfully. Indeed, the comparisons to Manchester United star Paul Pogba aren’t too far off the mark, for there’s definitely elements of his game that resemble the Frenchman. Standing 179 cms tall, it’s been important to note how he’s held his own in battles of strength, aerial duels and when riding challenges. Balanced and deceptively strong, Willock has provided a viable outlet for long balls, throw ins, set pieces and when holding the ball up, where he’s used all of his languid frame and notable leap to play his part. Meanwhile, his speed, acceleration and mobility have also served him nicely, allowing him to impact heavily both in and out of possession, but especially when carrying the ball, pressing or supporting a colleague. 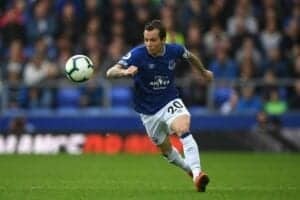 While he hasn’t been completely flawless with the execution of some of his technical actions, which is entirely reasonable considering his age and experience, there’s been a lot to like about his exertions with the ball at his feet. Possessing a tidy first touch and crisp ball control, he’s excellent at receiving in tight spaces. Thriving in such instances, after his initial touch to control, he then looks to make something happen using his tidy array of feints, shoulder drops, turns, shimmies or by playing fast one touch passes if under pressure. It’s been positive to see how effectively he scans his environment to continually update his mental imagery of his surroundings, so he arms himself with vital information. This subsequently means he can enhance the quality of his actions, as he knows where his opponents, teammates and the spaces are. Some terrific examples of this have arisen when he’s about to inherit a pass in a crowded area, where he will let the ball roll past his front foot and turn in the one motion. By doing so, he puts himself in a position to take his first touch towards his goal and on his back foot, which is far more ideal than receiving on his front foot and taking his first touch away from goal and towards greater danger. In full flight on the dribble, he’s a fearsome proposition too, with Willock always keen to carry the ball into spaces and use his speed and crafty changes of pace and direction to unbalance his markers. Never shy to take on an opponent 1v1, he shows great confidence in his abilities to bypass his man with pieces of skill. Partnering the aforementioned with his progressive passing, Willock has driven the Gunners forward with his aptitude in this regard too. Keen to break the lines and play teammates through on goal whenever the opportunity presents itself, his offensive intent has been fantastic to see. Moreover, his combination play in confined space situations has been another upside, for he’s moved the ball quickly to help carve open defensive units. Showing patience and composure if no vertical options are present, he’s crucially been happy to recirculate possession and wait for an upfield outlet to eventuate, instead of trying to force the issue. Willock then ties all of the above beautifully with his movement and positional awareness. An area of his game that’s really stood out, his understanding of space and how best to use it has been notable. Alert to when a colleague is about to receive the ball, he makes his moves early to catch his opponents off guard to provide an option. Whether it be when he drops in between the lines to connect play, embarks on his penetrative runs from deep in behind or pushes wide towards the flank, his anticipation and timing have been on point. 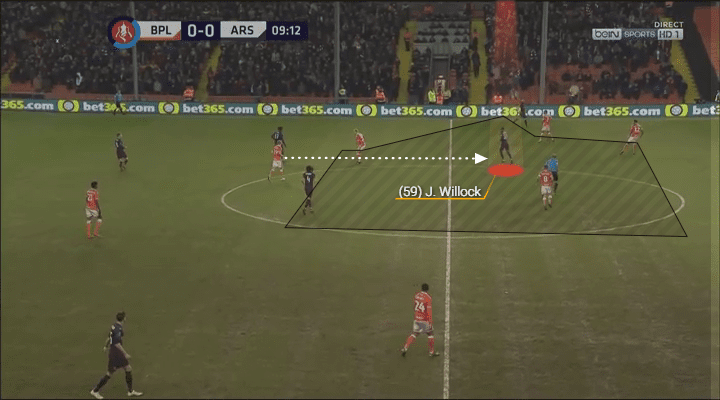 Effectively connecting play, manufacturing overloads in key areas, stretching his opponents, generating spaces for others (as seen below) and rotating with his mates, the long striding Willock’s parlayed power and finesse expertly in this aspect. A key reason behind some of his goals, Willock’s value here has certainly been keenly felt. 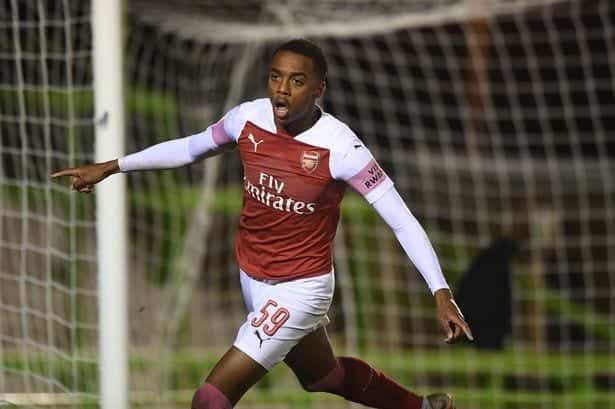 “It was one of my aims at the start of the season to push on and try to get in the box more and get a few more goals and help the team to victory so all the hard work is paying off,” Willock said on the topic. By the numbers, his 4.13 dribbles per game, 1.01 shot assists pg, 2.25 progressive runs pg, 1.88 touches in the box pg, 2.3 shots pg, 1.33 key passes pg and his 1.67 won aerial duels pg definitely accentuates his polished showings. Although it’s still early days in Willock’s senior career at the Emirates and he’s still got plenty of scope for development, the signs have been extremely positive that he’s got what it takes to make the step up to the first-team. Working under a manager like Emery who’s not afraid to blood the young talent at his disposal, it’ll be fascinating to observe what the future holds for this exciting academy product. Passing his early tests with flying colours, Willock’s fierce determination, exemplary attitude and undoubted talent should see him continue on his steady upward trajectory at his beloved Gunners. For any young footballer, charting Willock’s rise will serve as a fantastic motivation and inspiration that they too can fulfill their childhood dreams and turn them into a reality.